Some buddies came over last night and we made magazine baskets. My paper weaving phase is getting out of control. In the spirit of spontaneous DIY experimentation, we decided to create a new drink, whereupon we mixed peach vodka, raspberry lemonade, and Venetian Carnival Pinot Grigio (purchased for its exciting label). Not good; don't do it. Since we didn't drink much of the stuff, our baskets turned out pretty well. To make these, cut about 10 magazine pages into 2.5" strips vertically. Fold each strip in half lengthwise, then into thirds with the cut edges to the inside. (See folding pictures here, but don't do step D.) Then follow the guidelines here. Staples are too big to secure your strips in strategic places, so I used Zots glue dots. You could also use tiny pieces of double stick tape. I glued the strip around the rim with craft glue. These little baskets are about 4.5" square. I wish I'd thought of this before I got rid of a bunch of magazines!!! I'd seen the newspaper ones you did, but never thought of applying it to magazines! Well, I know what I'm goign to do with my new pile that's growing again! Love these! How did you do it though? Magazines aren't as long as newspapers, so how did you get them to wrap around? We made the magazine coasters last night and love them. Even my husband came home and said those are really cool! So cute! Hey what if you made a bunch of them and connected them to make little open box cars for a choo choo train, or made long skinny sky-scrapers for a mini-landscape? It is fun to think of things for OTHER people to do! Ha ha. Really, these are great. I attempted something similar this week with much less successful results! I need to try again. Love yours! I just read your drink ingredients and thought, "Hm, that sounds interesting, I should try that!" Then I finished reading the post, and cracked up. P.s. The baskets look great! Stephanie P, I just added some instrux. Bonnie, don't try it! I'd leave out the wine if I were you, the peach vodka and raspberry lemonade sound like they would work pretty well together! Um, no thanks. Don't worry, there are still plenty around here. Thanks! My kids and I are going to look through magazines tonight! I have a ton and love all the recycled projects you are doing lately. Love 'em!!!! Y'all must have had a blast too! Brainstorming about good craft projects for the August meetup, too! 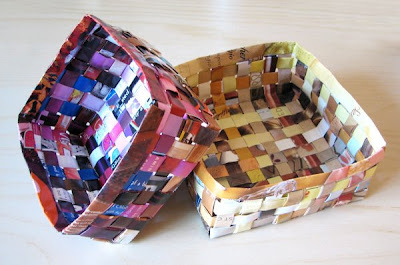 I am totally into your paper weaving craze...such cool projects, thanks! Hello from Germany and Holland, where cool design abounds. I made a basket today! it was so much fun. Thank you for such a great idea. Although my basket didn't come out exactly like the ones in the pictures, I'm sure if i made another one it would be better. I also used stick glue, instead of tape or staples and that worked just fine. How sturdy are these baskets? Could I make larger ones and use them as storage in a play room? They're quite sturdy in this small size. Probably the larger you make them, and the more surface area on the sides, the floppier they might get. Not sure at what point they'll become too floppy; the folded paper is pretty strong. These would be great for gifting the soaps I make. Thanks for the post and instructions. I know what a few people will be getting for Xmas now as stocking stuffers. Very inteligent, and nice to do like hobby, creative idea! !